Cathepsin B is distributed in all animal cells in high contents. The stereo-structure of cathepsin B was clarified using X-ray crystallographycal picture by Huber, Bode (Max-Planck Inst., Germany), Turk (Jožef-Stefan Inst, Slovenia) and Katunuma (Tokushima Bunri University, Japan) in 1991. Using the stereostructure of the substrate binding pocket of cathepsin B, Professor Katunuma and his colleagues designed specific inhibitor of cathepsin B, named CA-030 and CA-074. They show specific inhibition at 10-7M, both in vitro and in vivo without any toxicity. 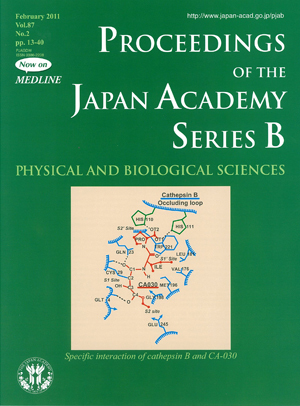 Then in 1995, they clarified the specific binding mechanisms between cathepsin B and CA-030 using their X-ray co-crystallography, as shown in this cover illustration. The other cathepsins do not have such an occluding loop over the substrate binding pockets similar to cathepsin B. Therefore, “A structure-based specific inhibitor design” is possible and they have developed, using this methodology, specific inhibitors for cathepsins L, S and K.
The experiments using specific inhibitors for individual cathepsins in model mice revealed specific biological functions of cathepsins in vivo; the role of cathepsin B in antigen processing; the role of cathepsin L in cancer metastasis, TGF-β production, and glucose uptake; the role of cathepsin S in the pathogenesis of Sjogren’ syndrome, and in the regulation of the amount in MHC class II molecule in the cell surface, as well as the role of both cathepsins K and L in osteoporosis.